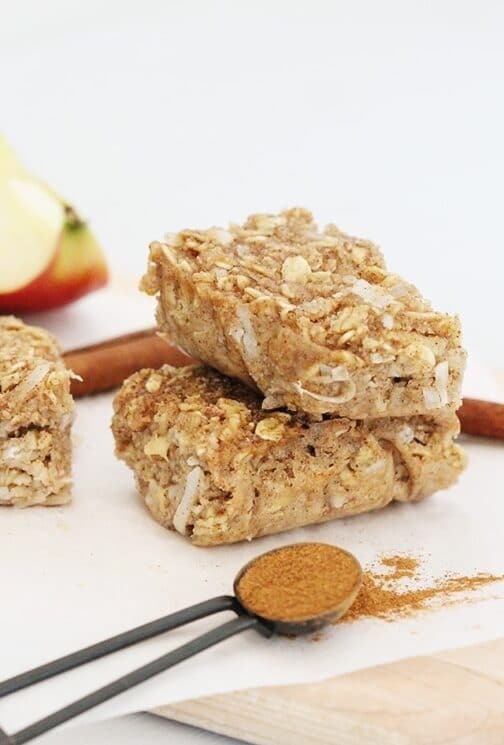 Be prepared for busy school mornings with a kid-friendly apple cinnamon oatmeal breakfast bar! The perfect, nourishing breakfast on the go – or grab from freezer to lunchbox for quick packing! 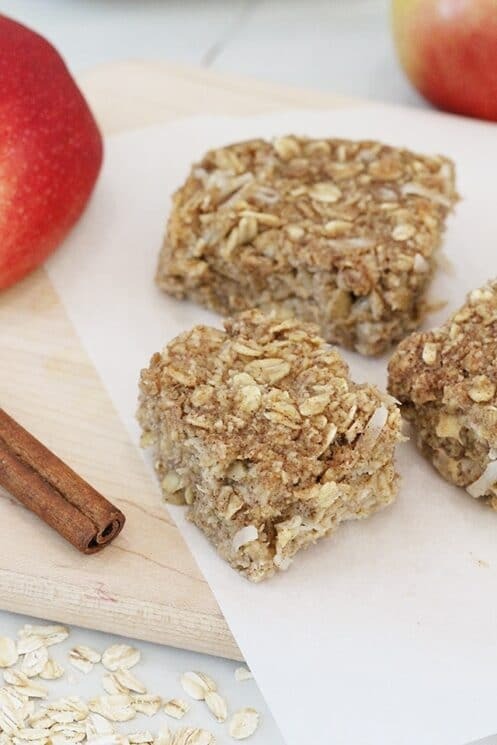 Another great quick breakfast we love is our Healthy Apple Muffins that also freeze really well! After sleeping and growing during the night, kids need to refuel their bodies for the day ahead. Breakfast provides energy for the morning and eating breakfast can lead to increased classroom concentration. Can you imagine trying to participate in a science experiment or concentrate on solving a number problem with your tummy grumbling? It’s tough, especially for kids who aren’t allowed a snack at school. Breakfast is their only chance of eating prior to lunch. Our favorite school morning breakfasts are those that are grab and go, already most prepared or those that just need a few things mixed in before they are done. 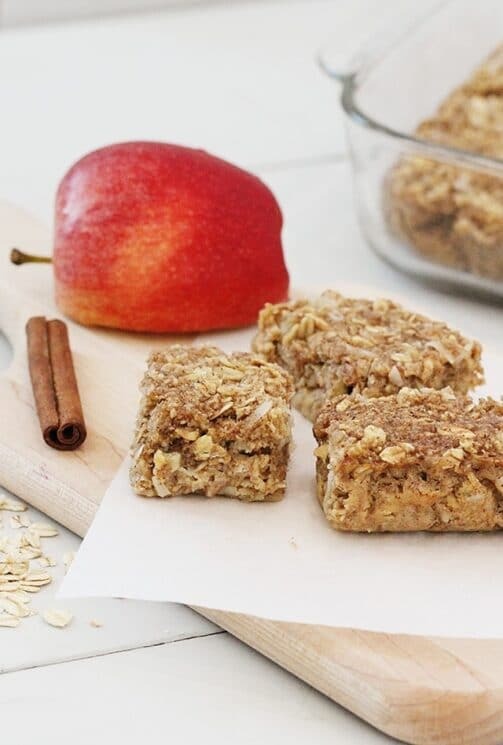 These oatmeal breakfast bars definitely fit the menu of a busy school morning. 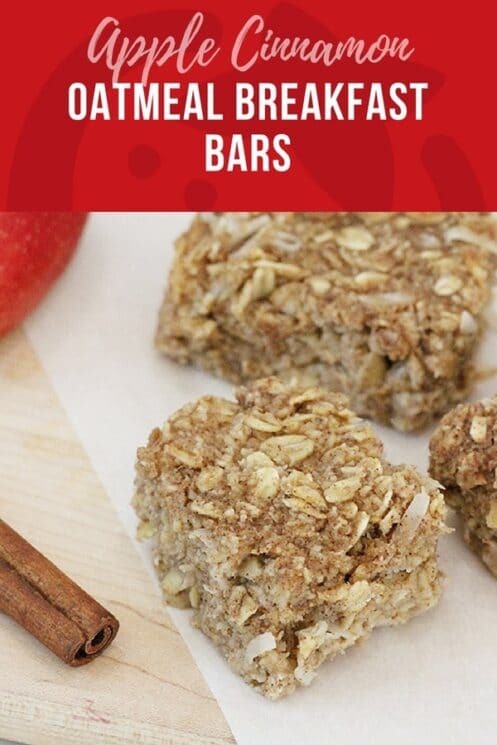 Not only are they simple to make, but they are packed with good nutrition for your kids for the day! 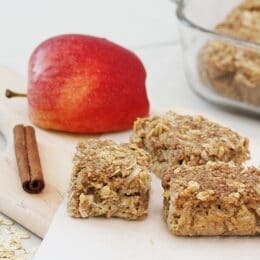 We love these bars because they have some of our favorite breakfast ingredients that really help fuel our kids. We always make them ahead of time, making them an easy grab-and-go breakfast. Oatmeal: Oats are really well-balanced. They are a good source of carbs and fiber. They also contain more protein and fat than most grains. Oats are loaded with important vitamins, minerals and antioxidant plant compounds. Apples and Applesauce: Apples are extremely rich in important antioxidants, flavanoids, and dietary fiber. There have been so many studies performed on the health benefits of apples which is why the saying still rings true ‘An Apple a Day Keeps the Doctor Away’! If your kids are lighter breakfast eaters, this will fit the bill entirely for them. If they need more, you can serve it with a glass of milk, small bowl of yogurt or a boiled egg. You could also serve it with a green smoothie to get some veg in! I even plan to use these bars as a quick lunchbox add-in! You can easily double this recipe so you don’t have to make them all the time. As it is this recipe makes 8-12 bars, depending on how big you cut them. Always plan the night before. Make sure you know that you have the ingredients or foods prepped that you want to have for breakfast stocked and ready to go. Make a breakfast rotation and print it so your family knows what is on the menu. Have at least 4 make ahead breakfast meals stocked in your fridge or freezer to pull out when you are really short on time. Grease an 8×8-inch baking dish. Preheat oven to 350 degrees F.
Place 1 cup oats in a blender or food processor and process until oats turn to a flour-like consistency. Add to a mixing bowl with additional 1 1/2 cups of oats, cinnamon, baking powder, and salt. Stir to combine. In a separate bowl whisk together the egg, applesauce, vanilla, milk and honey. Pour into dry ingredients and stir until combined. Grate apple and add to batter with coconut flakes. Fold into mixture. 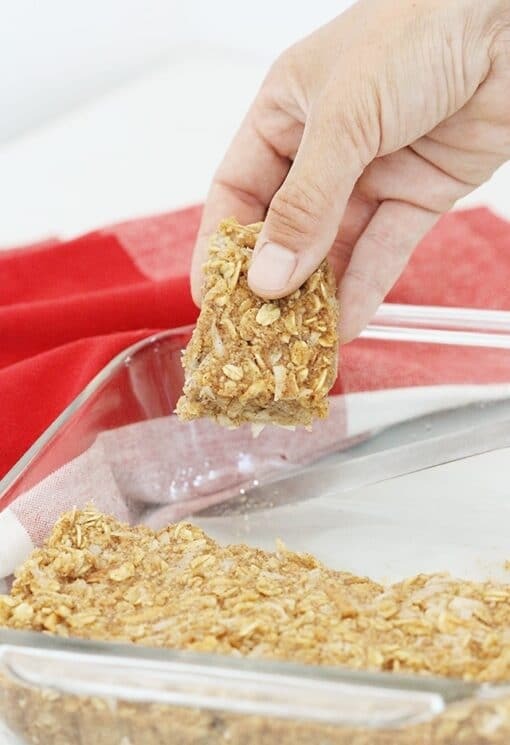 Pour into baking dish and bake for 30 minutes, or until a toothpick inserted comes out clean. Allow to cool slightly; cut into bars and serve. Any recommendations for substitutes for coconut ingredients? Hi, these bars look great. Do you really need 4 different types of flour? Could I make do with coconut flour and almond meal/flour? Can we add some oats to this? These look delicious BUT we can’t have almonds 🙁 what could I substitute the flour with? I know this is an old thread, but i am curious I find the rice and tapioca flours can be omitted and just increase the almond and or coconut flour. Our bodies have severe reactions to rice. And we just avoid tapioca. Would substituting whole wheat flour work? Could you substitute the milk with almond milk? These bars are so delicious! I made a double batch with hopes they would last a little while, but I’m sure they will be gone within a few days. I topped them with coconut flakes when i put them in the oven and they are so pretty! I also used almond milk since we are dairy free. Turned out great and my kids love them! Would use a little less honey next time. Otherwise so yummy! Am I missing something when reading mthe ingredient list? The only “flour” I see is the oats which are finely ground. Why are people talking about coconut, rice and tapioca flour? I plan on making this soon for my husband when he starts harvesting the corn and beans in about a month, Our five year old son will love it too for snack food when he joins daddy on the combine. Sorry, this is an old recipe, that we’ve updated, so the old comments don’t really apply anymore! The new recipe has been tested to work better! Instead of putting 1 cup of the oats in a food processor (I don’t own one) can you just use oat flour?? That is a whopping amount of carbs and sugar. Once the kids get to school, they will have a sugar dive and will be sleepy and cranky. Natalie, can you tell me the serving size of this recipe? 25g of sugar is higher than I’d like to serve to my toddler. These are great! I substituted almond milk for the milk and added some chopped strawberries since I had a small apple. I also used unsweetened coconut. This was perfect for all of us, including my husband and I.
Wow! That’s a lot of sugar! Can I leave out the honey entirely? You can try it, but I haven’t. Let me know if it’s sweet enough if you omit the honey. I’d probably start with just using half the amount! We haven’t tried freezing them – I’m not sure how the texture would hold up. But you can refrigerate them and they will last longer. Good luck! I made a batch today and my 9 year old loved these. I used less honey than called for in the recipe (1/3 of a cup) and I think I could have reduced the sweetener to 1/4 cup and it would have been fine. There is lots of sweetness from the applesauce. I tend to prefer less sugar in snacks and desserts.